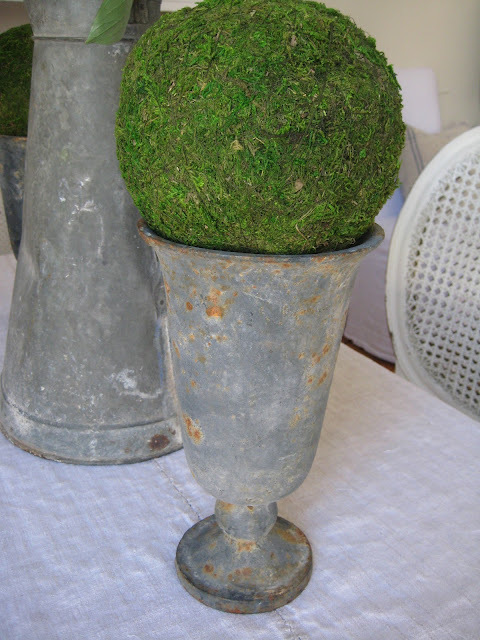 I love to find old urns at flea markets or antique fairs. 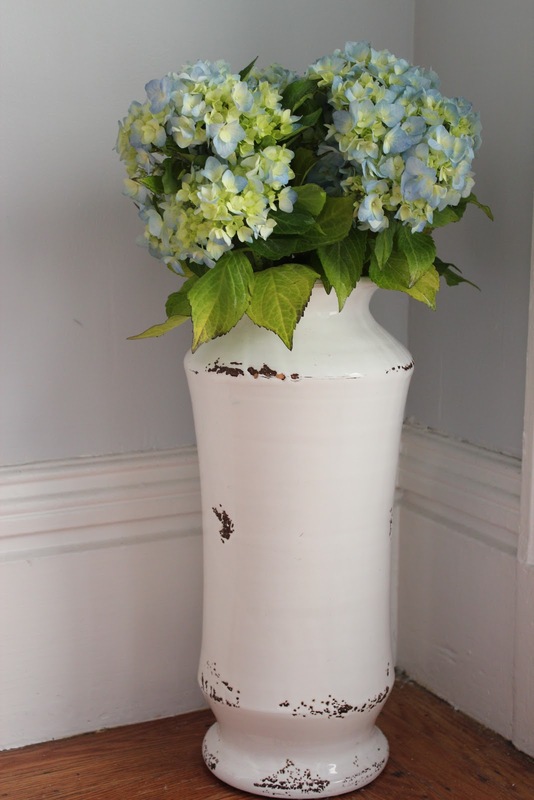 The white one below came from a tiny annual flea market at Alamo Square here in San Francisco. I paid 10 dollars for it and it weighs about 40 pounds. I like how the glaze is worn off in places. It sits right inside the front door. I love the color and patina. I would have topiaries in every room if I could keep them alive longer. I don't seem to have a problem with orchids, but topiaries are another story. 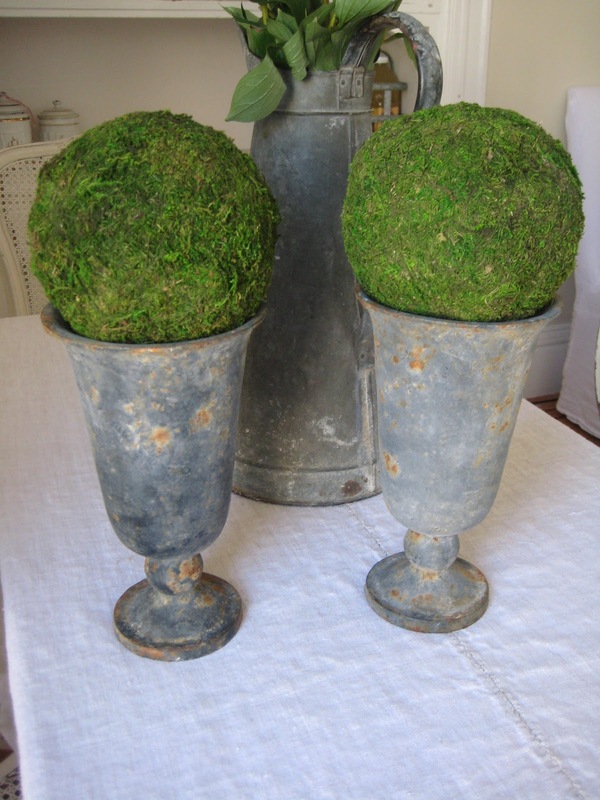 I also like to use moss balls wherever I can. They are available everywhere online but I pick mine up at Michaels. I drove 70 miles each way to pick up this pair of urns. 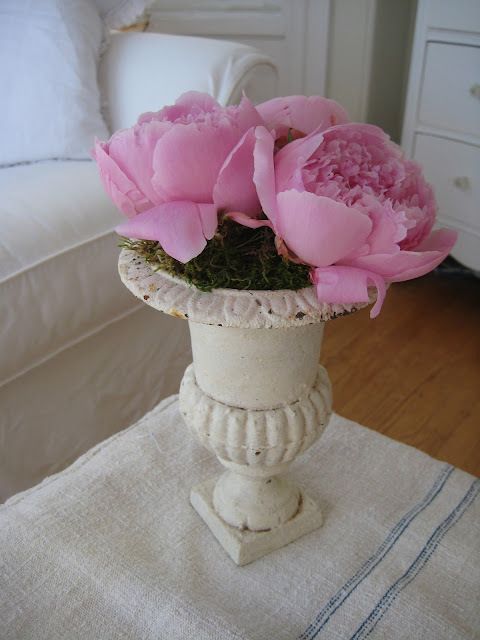 I placed a very small bud vase inside this urn to hold these peonies. I put moss around the base to cover the vase and fill space. 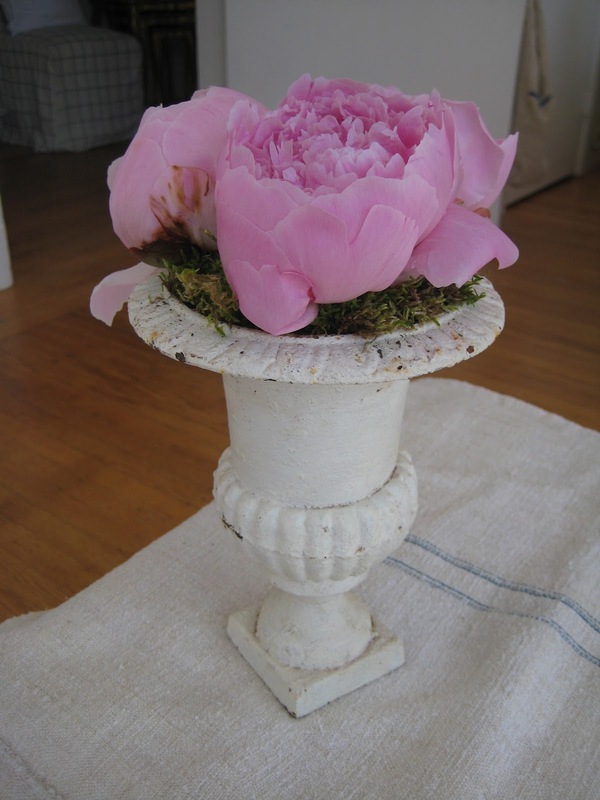 Those peonies will be fabulous when they open up, too! Mine are loooooong gone for the year. 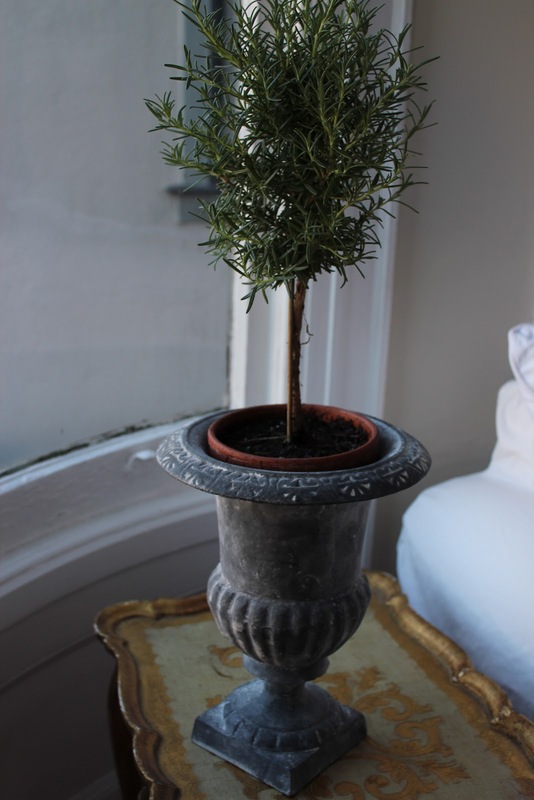 You can probably grow Orchids and not keep topiaries alive b/c Orchids need nearly no water and most things topiary need good soaks regularly once they dry out. You see I tend to overwater so I know these things, haha. Thank you for visiting and watching the video I most liked the tree branches she created , I want to do some in our shades of pale. Michele, I could so move into your home, it's so me. 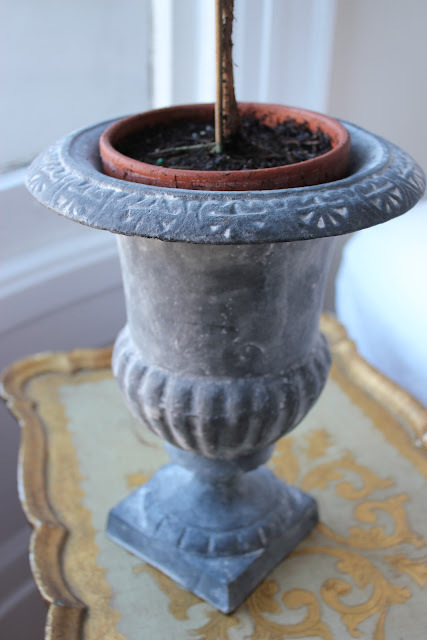 The last white urn I have one, and I am drooling, sighing, and crushing on those goblet zinc style urns of yours they are fabulous. Your table setting is so perfect that I wish it were in my home, truly!! Keep inspiring us Michele, you do it best. Beautiful Sunday to you and an inspiring week to come. I always enjoy seeing snippets of your pretty home! I love urns too. They just seem romantic looking to me. You have some nice ones. What a great deal on that white pottery piece too! That's truly a case of being at the right place at the right time! love the zinc urns. i would have driven for them as well.